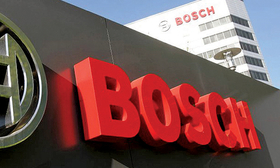 BOXBERG, Germany -- Robert Bosch expects its automotive division to increase revenue by 7 percent this year to about 47 billion euros, the company said here on Tuesday. That growth rate would exceed the 5.5 percent increase achieved by the world's largest supplier last year and would be nearly three times faster than the estimated rise for global passenger-car production. Bosch's auto division, which is called Mobility Solutions, is bullish because it expects to benefit from major automotive trends such as move toward autonomous driving and electromobility. Bosch's auto division boosted 2016 sales 5.5 percent to 43.9 billion euros. It ranks No. 1 on the Automotive News Europe list of the top 100 global suppliers. Europe accounted for 46 percent of that total.